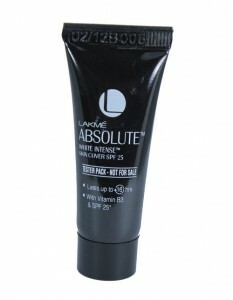 Lakme Absolute White Intense Skin Cover SPF 25 Foundation Golden Medium has water based, ultra light, oil free formula which delivers naturally breathable, fair skin. Its unique formulation hides fine lines, uneven skin tone, pores to leave your skin peachy soft throughout the day. 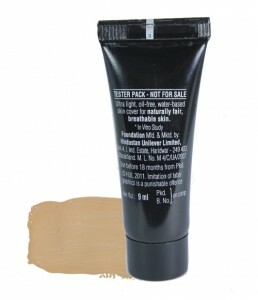 It has vitamin B3 and SPF 25 which gives you flawless fair complexion with complete coverage. I have used many foundations but cannot find one that suits my skin tone. 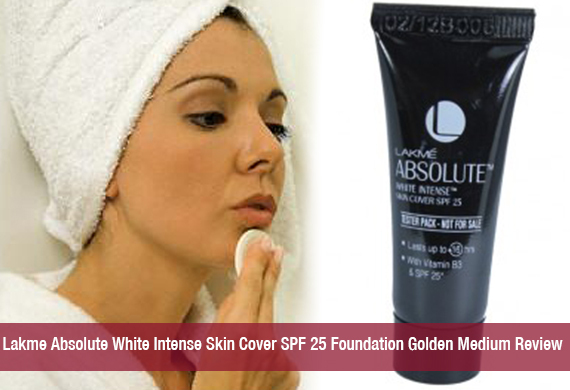 I tried Lakme Absolute White Intense Skin Cover Foundation in Golden Medium shade. It perfectly suits my complexion. It blends easily into skin. It gives a matte finish and light to medium coverage. It does not break me out. It has vitamin B3 which improves skin tone with regular usage. It stays on my skin for long time. Thank God I don’t need any touchups. It does not cake as compared to other foundations. I liked plastic mists over the bottle when I take it out of the refrigerator. I love the coldness of the cream like texture, generally during summers. I had problem of open pores and uneven skin tone. Undoubtedly I can say that this product has helped me a lot. This foundation solved the problem of open pores. My complexion has improved. Besides this, it is very light on my skin. I just love my skin after applying it. It also protects skin from sun exposure. The packaging is very classy. It is travel-friendly, portable and comes with a pump which gives you right amount to cover the face. Lasts for up to 16 hrs…you don’t need touchups. It is matte; so I don’t feel the need of powder on top of it. It has a citrusy smell. It can be a problem for those who cannot withstand this smell. The container inside the plastic covering is opaque so, you cannot see how much foundation is left. It can be a foundation for daily use. If you love light foundations then this is the best product for you. Overall it is the best foundation that I have ever used. I suggest everyone to try this it once.